Head and body length: 3.7- 4 inches. Tail length: 3.7- 5 inches. Weight: 1-1.7 ounces. Color: fur is long and soft; the upper parts are sandy brown, pale buff, orange buff, or pale grayish buff. Range - Nambia, the Cape province of South Africa, and extreme southern Botswana. Habitat - Gravelly, sandy, thornbush plains. These animals are mainly solitary in the wild. Breeding season is around August- September. The gestation is 56-61 days. The usual litter size is 2. 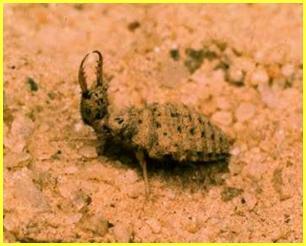 The antlion larva digs its pits in dry, sunny spots sheltered from wind and rain, particularly on south-facing slopes. The soil must be light and easy to shift. Pushing itself backward, the larva first draws a circle on the ground. Then, digging deeper and deeper, it spirals in toward the center. The dirt that is dug out is thrown out energetically with the head. After only about 15 minutes, the antlion has made a funnel-shaped crater in the earth. The antlion larvae prepare the sides of their pits with fine sand or soil particles so ants that fall in can't climb out, and land in the jaws of the "doodlebug" waiting at the bottom. It buries itself at the bottom so that only the head, with opened jaws, can be seen, and there it waits for its prey. Very similar in habit and appearance to the White-billed Buffalo-Weaver. The female and juvenile birds are quite distinctive being brown above and spotted or streaked below. The Red-billed Buffalo-Weaver builds massive thorny nests in acacia or baobab trees and these are used as communal roosts. 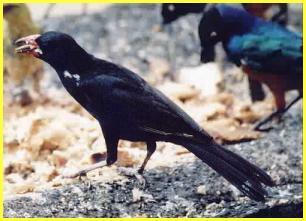 They are noisy and gregarious birds, frequently found feeding on the ground alongside starlings. 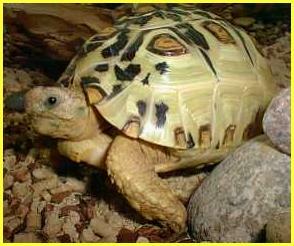 The Leopard tortoise is a large and attractively marked tortoise which has a wide distribution in sub-Saharan Africa, including recorded localities in southern Sudan, Ethiopia, Eastern Africa (including Natal), Zambia, Botswana, Namibia, Angola and Southwest Africa. In this species males may attain a greater size than females, a characteristic shared with certain other members of the genus Geochelone, including Galapagos tortoises. Large examples may be 60 cm (over 2 feet) long and weigh over 35 kg (about 80 lbs.). 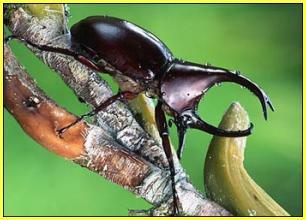 Rhinoceros beetles grow to be between 1 and 2 1/2 inches long. Both sexes have horns, making it difficult to distinguish between them. Male beetles use these horns for fighting rival males over feeding sites or females. Rhinoceros beetles also use their horns for digging, climbing and mating. So many small animals are at the mercy of drivers on highways, especially endangered or protected species. Driving slowly and safely is good advice from any Title Max title loan expert, but it will also help save the lives of any animals along the road.